Most books dedicated to the issues of bio-sensing are organized by the well-known scheme of a biosensor. 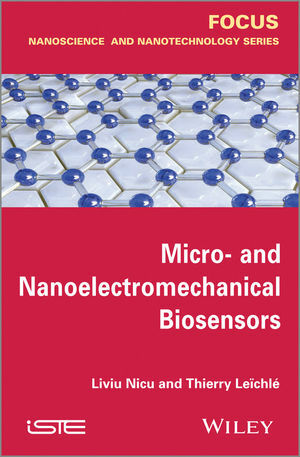 In this book, the authors have deliberately decided to break away from the conventional way of treating biosensing research by uniquely addressing biomolecule immobilization methods on a solid surface, fluidics issues and biosensing-related transduction techniques, rather than focusing simply on the biosensor. The aim is to provide a contemporary snapshot of the biosensing landscape without neglecting the seminal references or products where needed, following the downscaling (from the micro- to the nanoscale) of biosensors and their respective best known applications. To conclude, a brief overview of the most popularized nanodevices applied to biology is given, before comparing biosensor criteria in terms of targeted applications. Thierry Leïchlé is a CNRS researcher at the Laboratory for Analysis and Architecture of Systems in Toulouse, France. Liviu Nicu is a full time CNRS (National Center of Scientific Research) researcher the NanoBioSytems Group at LAAS in Toulouse, France.